I have a wonderful A MEANINGFUL GARDEN post for you today from a fellow blogger, Jacqui of Dusty Country Road. I LOVE Jacqui's blog - she writes so thoughtfully on a number of topics that strike a chord with me. Recently, I've been so taken with her surrender to an intentionally slower pace in her and her families daily life, a simplification of all 'The Busy' that goes on (and decluttering - who doesn't love a good decluttering post?!). I spied lots of beautiful photos and posts about her garden and how she's been weaving it into her and her son's days at home, and immediately knew her garden story would be perfect for this series. So, here she is! Enjoy. My garden means so many things to me - it is a place to sit and just be, a place to grow food, a place to watch the seasons and how they change. A place to enjoy the wonder of our world, close up. A place to create beautiful spaces furnished with beautiful plants, and a place to cultivate the patience necessary to see the garden you dream of grow into itself. But most importantly for me, right now, my garden is a place of wonder and intrigue for my one year old son. And this is the most meaningful thing. Every day, we are drawn to the outside, on good weather days twice. In the morning space, after breakfast and clean up and house chores, we wander outside and get to work. And again in the afternoon, after nap time. We need the time outside, to breathe in fresh air, get our hands dirty, work just a little bit at a time at making the garden how we want it to be. As I let the chooks out of their run, he gets busy with his garden tools. He digs in a pot of coriander, and scrambles over rock walls in the herb garden. 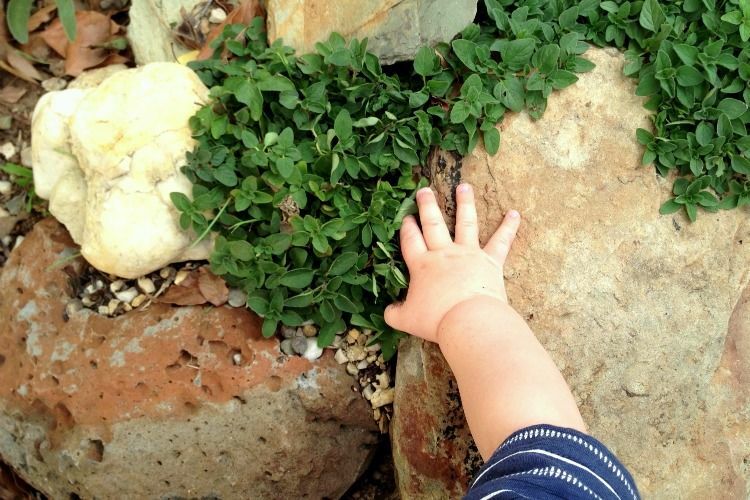 To me, the rocks are a step up; to him, a great big climb to reach the object of his desire - oregano growing up on top. He puts little stones in his mouth; I say 'spit it out please, let's have some mint instead'. And off he clambers to the mint, he knows exactly where it is. My little gardener with minty fresh breath. The chooks are constantly in the vegie garden, and when I'm not chasing chickens out, I'm gently guiding him away from the tiny pea shoots emerging, or the broad beans that cope so well with being sat on. He is a master capsicum forager, spotting the green bounty from a distance and moving so fast to his target, he expertly snaps them off the little plant and crunch crunch crunches them with his teeth. I can't help but be impressed, even though I would sometimes like the capsicums to grow a little longer. The rainbow chard is another favourite, bright stems the perfect thing to munch as he makes his way around the garden. 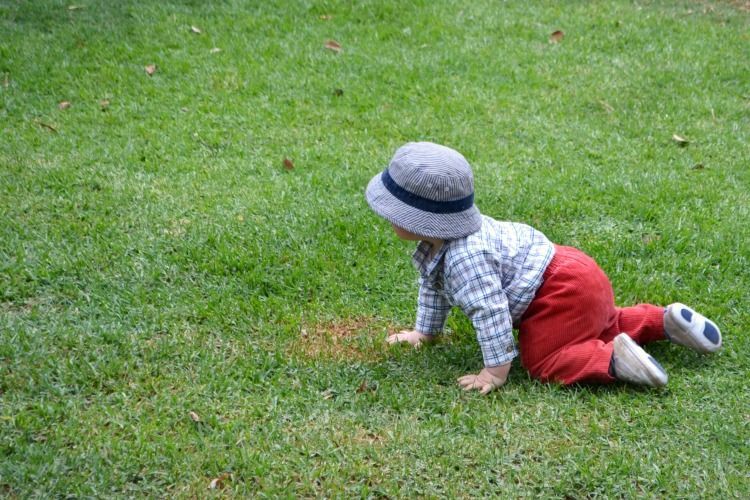 On the weekend when Dada is home, the grass becomes the playground, with gloomping like a frog and giggles galore. Their time to be in the garden together, a time for me to sit back and watch, drag myself away to have 'me time' or dig at my own garden projects. It is so lovely to see the grass being used in this way, a real green carpet for play and soft landings. I never really appreciated grass before now, but I see how perfect it is now for outside play. It's not all about pretty plants and vegie gardens. And when it's time to go inside, the outside shoes are left at the door, and little hands are washed, and most often, a little change of clothes is needed. It is a dirty business, being out in the garden. Perfectly, delightfully, dirty. And fun. On a rainy day, when we're stuck in the house, little hands rest again the glass, eyes looking longingly outside. Both his and mine. Soon he will be big enough for jumping in puddles and making mud pies. So many things to experience and enjoy. I might even jump in a puddle out there too. This is how my garden is so meaningful to me now - a wonderful place for a little person to explore the world, get his hands dirty and know what it is to be a human, grounded on this beautiful planet of ours. I had no idea being in the garden with my little one would be this good. It is, hands down, the best. Thank you so much Becs for having me here on Think Big Live Simply! Jacqui is a writer on the blog Dusty Country Road, a blog about living a simple, mindful, sustainable life. There you will find inspiration for a different way of life; a way of life where doing less is valued, where food is grown in the garden, where meals are cooked from scratch, where we make do and make our own. Jacqui shares her life with her husband and infant son and started writing Dusty Country Road when they lived in a little house on a dusty country road (funny that!). They can now be found in a regional town in Central Victoria, focused on raising their son and living sustainably on a small town block. She believes, among other things, in growing communities, in things handmade, that real food comes from the earth and in having less and being more. You can connect with Jacqui on her blog and on her gorgeous Instagram feed.